Illinois cattlemen and cattlewomen will have the opportunity to here from industry experts at the 2015 Illinois Cattle Feeders Meeting. The meeting will be held on March 5th at the 4-H Auditorium in Macomb, IL located across the road from the Extension office. The seminar will be start at 9:00am and conclude at 4:00pm. "This meeting is a must-attend for Illinois cattle producers. First-hand access to this kind of knowledge in the cattle industry is rare." says Travis Meteer, University of Illinois Beef Extension Educator. Dr. Galen Erickson, University of Nebraska-Lincoln, Feedlot Nutritionist will be on hand to discuss feeding elevated amounts of corn silage in finishing rations and the effect on profit. Dr. Galen Erickson and his research team are leaders in investigating feedlot nutrition and management topics. He will offer insight on feedstuffs, feeding, and nutritional management and feed technologies. Along with corn silage feeding he will be discussing use of beta agonists in feedlot cattle. 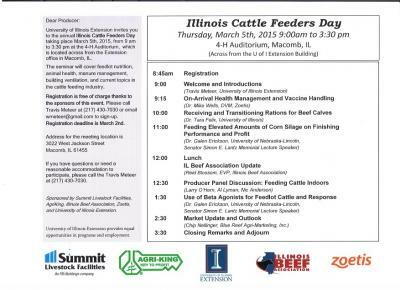 Dr. Tara Felix, University of Illinois, Feedlot Nutritionist will discuss receiving and transitioning rations for beef calves. This topic should be of great interest to cattlemen focused on profits. High calf prices make on arrival and early term management extremely important. Dr. Felix leads the U of I team in investigating feedlot nutrition and management areas. Dr. Mike Wells, DVM, Zoetis will be discussing on-arrival health management and vaccine handling. Proper attention and focus on calves as they arrive in the feedyard has proven to be large determinant on profit. Dr. Wells will elaborate on health management and offer troubleshooting discussion of your questions. Chip Nellinger, Blue Reef AgriMarketing will present a market update and outlook. Mr. Nellinger has over 20 years of experience in the futures industry and helping producer manage risk. Chip will help advise producers on how to handle added volatility in the cattle market and how to best manage risk. He will offer insight to what the markets hold and future opportunities for cattle feeders and cow/calf producers. 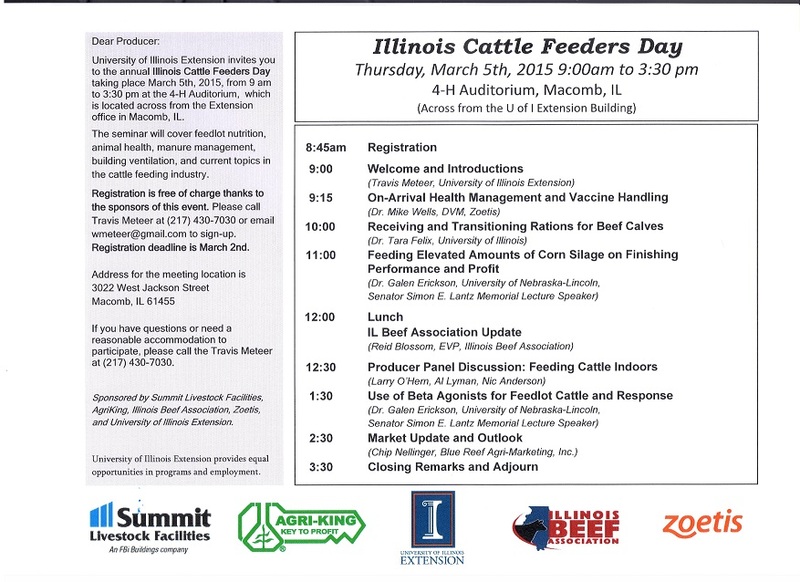 Cattle feeders Larry O'Hern and Al Lyman will share their cattle feeding experience during a panel discussion with Nic Anderson, Illinois Livestock and Development Group and Travis Meteer, University of Illinois Extension. The discussion will focus on do's and dont's of cattle feeding as well as the opportunities feeding cattle indoors presents.